With all these achievement and their intention to move to a new home in Las Vegas after completed stadium construction in 2020, the Raiders are the subject of a lawsuit by city of Oakland. The city has brought federal proceedings against the Raiders and the NFL in search for millions of debt relief in the renovation of the Oakland-Alameda County Coliseum and claimed damages for what it considers to be an illegal transfer to the city of Las Vegas. The city is not asking the courts to force the team to stay in Oakland, but wants the city and its inhabitants to get their money back. Eliminating the Oakland-Alameda County Coliseum as an option for next season and with the city suing the Raiders, it is obvious that the Raiders will have to play next season somewhere else. It is without argument that the Raiders will play all their 2020 homes games in Las Vegas but their major worries is where will they play their 2019 season. So what are the Raiders options during this time of uncertainty? The Raiders are in need of a one-year stadium, till their 1.8 billion dollar stadium in Vegas is finished. 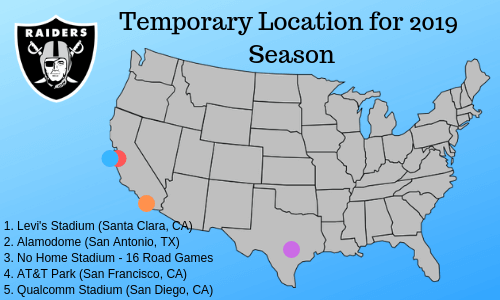 Below are some possible temporary stadiums that could accommodate the Raiders for the 2019 season. Levi’s Stadium (Santa Clara, CA) – Levi’s Stadium currently houses the San Francisco 49ers and the Raiders could easily settle there for a year and stay close to their home market of Oakland. It could also be the league’s preferred option if the Coliseum is out, because it doesn’t mess with markets already claimed by other teams. Alamodome (San Antonio, TX) – Raiders had been flirting with San Antonio for along time; before moving to Los Angeles and before choosing Las Vegas; San Antonio was in the mix of possibilities. The property is also NFL-ready, but it is a long distance from their loyal fans of California. Also, this would put a marketing infringement with the two other teams in the state of Texas the Dallas Cowboys and Houston Texans. No Stadium, 16 Road Games – The theme here is the famous song by Willie Nelson “On The Road Again.” Crazy idea and never done before in the NFL. The only good aspect about this idea is that the Raiders would not be stepping on any other teams territorial area. 16 road games would certainly put a strain on the Raiders team and Coach Jon Gruden would hate it, as the team will always be on a road trip with no local fan support. AT&T Park, Memorial Stadium, Stanford Stadium (San Francisco area, CA) – The Raiders may not be able to play in the Oakland-Alameda County Coliseum next season but don’t be too surprised if they end up staying in Northern California next season. Playing in the Bay area will be the cheapest and a easy layup for the silver and black. If Levi’s Stadium will not workout, then San Francisco Giants’ AT&T Park, University of Cal Golden Bears’ Memorial Stadium or Stanford Cardinals’ Stanford Stadium will probably be the last resort for the Raiders. Qualcomm Stadium (San Diego, CA) – Given the fact that the Raiders have a huge fan base in both northern and southern California and the Qualcomm Stadium is capable of accommodating the Raiders. And also it would be a short flight for the Raiders to play home games while continuing to practice in Alameda, so San Diego could be a prospect over several others. The Raiders did play in San Francisco back in 1960 and 1961 and could be heading back to SF for the 2019 season. Sup.-elect Matt Haney said, “People want the Raiders to keep their word and play in Oakland,” but will it actually happen. While we do not known where the Raiders will be in 2019, we do know they will be in Las Vegas in 2020. So the gypsy Raiders are homeless as they get ready for the start of the 2019 season which begins in about 9 months. Stay tuned!